John Coughlin has been named the new head coach of East Stirlingshire. The former St Mirren and Berwick Rangers boss resigned from his last job, with Second Division club Stenhousemuir, in December. Shire chairman Les Thomson said: "John is an excellent coach who has proven himself in the Third Division and has winners medals to prove it. "To attract such a prominent figure from the world of football management is a significant coup for the club." Jim McInally and assistant David Nicholls left the Falkirk club after they avoided finishing bottom of Division Three on the last day of the season. "John has been left in no doubt that there are real challenges ahead for this club, but he has not seemed put out by them and that has really impressed us," Thomson told his club website. 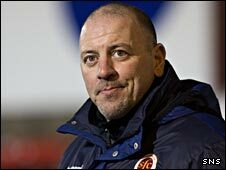 Coughlin, who will announce his backroom team soon, won the Third Division title with Berwick in 2007 and guided Stenhousemuir to Division Two via the play-offs in May 2009. However, he resigned last year from the club who are Shire's landlords after a 6-0 defeat by East Fife left Stenny deep in relegation trouble.